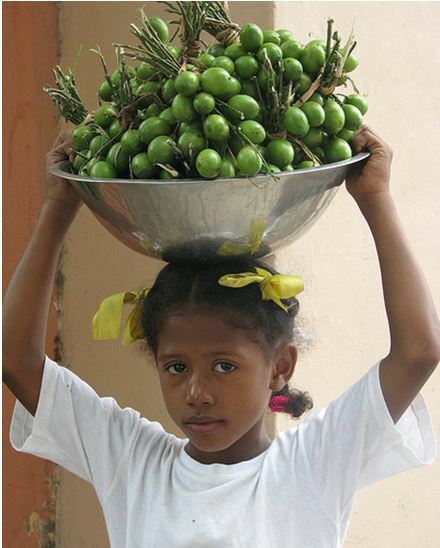 Mamon is a native to the Caribbean region of Tropical America. It is found grows in Central and Northern South America. It has also been introduced for cultivation in Florida State of the United States. 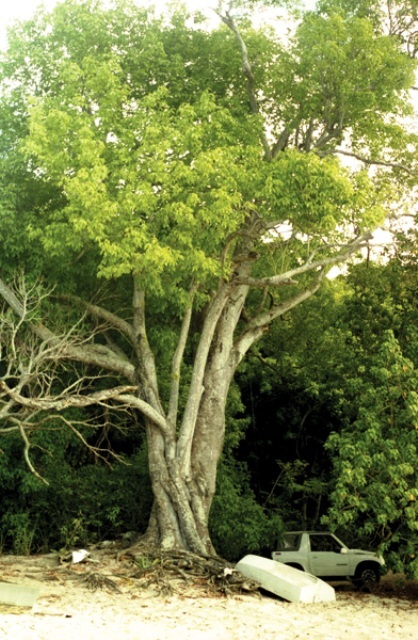 A large tree upto 30 m high, trunk upto1.7 m thick; smooth, bark smooth. Leaves briefly deciduous, alternate, compound, having 4 opposite, elliptic, sharp-pointed leaflets 5-12.5 cm long and 3.25-6.25 cm wide, rachis frequently conspicuously winged. 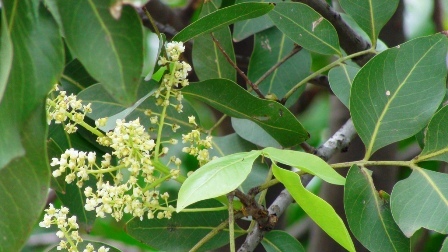 Flowers borne on 6-10 cm long slender racemes, often clustered in terminal panicles; fragrant, white, 5-8 mm wide, petals 4, stamens 8; male and female flowers usually borne on separate trees but some trees partly polygamous. Fruits green, nearly round, tipped with a small protrusion like that in some limes, borne in branched clusters; skin, pulp (aril) salmon coloured or yellowish, pulp (aril) salmon-colored or yellowish, translucent, gelatinous, juicy but very scant and somewhat fibrous, usually clinging tenaciously to the seed; pleasantly acid when fully ripe. Seed mostly one, large, yellowish-white, hard-shelled, some fruits have 2 hemispherical seeds; kernel, white, crisp, starchy, and astringent. 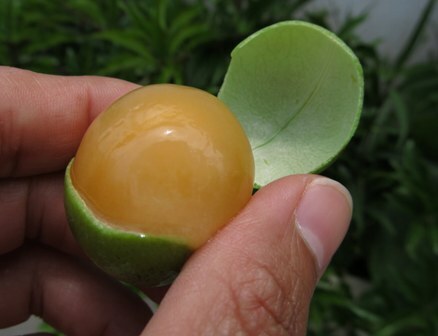 Mamon fruits are eaten fresh. For doing that, rind is torn open at the stem end and the pulp-coated seed is squeezed into the mouth, the juice being sucked from the pulp until there is nothing left of it but the fiber. With fruits that have non-adherent pulp, the pulp may be scraped from the seed and utilized to make pie-filling, jam, marmalade or jelly, but this entails much work for the small amount of edible material realized. Peeled fruits are boiled and the resulting juice is prized for cold drinks. In Colombia, the juice is canned commercially. The seeds are eaten after roasting. Indians of the Orinoco consume the cooked seeds as a substitute for cassava. Mamon can grow on a quite wide range of soils including poor rocky soils of dry areas. However, it is sensitive to cold and cannot survive even little frost. Propagation is mostly by seed. Some superior clones have also been marked and these are multiplied by air layering or grafting. Trees of seedling origin vary too much in fruit quality so it is always better to buy vegetatively propagated plants. or better varieties can be air-layered or grafted. There is much variation among seedling trees in yield and fruit quality, so it is always best where possible to buy grafted or air-layered trees to get superior fruit. Some named varieties of mamon are available in Florida. Two of these are Queen and Montgomery. 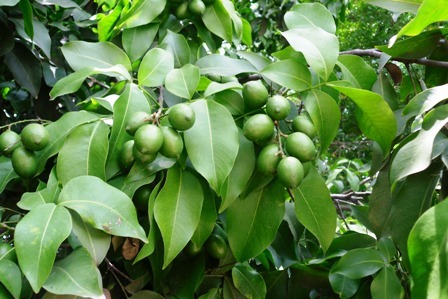 Mamon trees respond very well to fertilizer application which should be added 3-4 times a year. There does not seem to be any serious disease of pest problem in case of this fruit. In Venezuela, roasted kernels are pulverized, mixed with honey and given to halt diarrhea. The astringent leaf decoction is given as an enema for intestinal complaints.